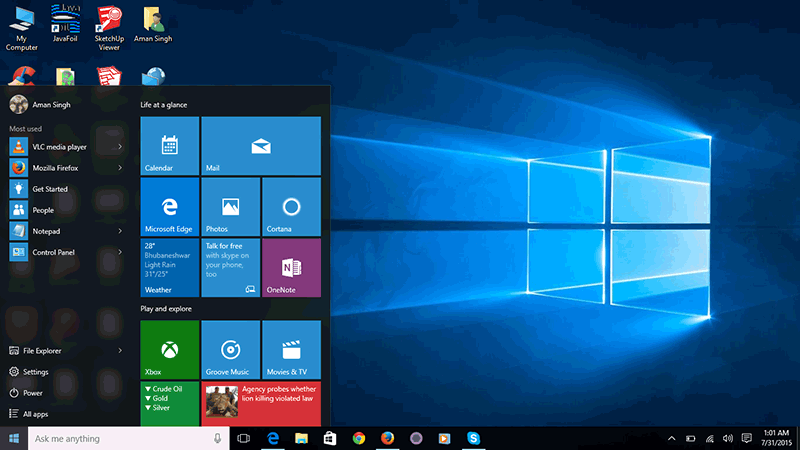 As it has been observed many of the users aren’t getting the WINDOWS 10 UPGRADE APP. So, here is a quick how to het it. Copy the following text and paste into the notepad. schtasks /query /TN "MicrosoftWindowsApplication ExperienceMicrosoft Compatibility Appraiser"
3. Save it as ‘ReserveWindows10.cmd’ to a directory called temp or whatever you like in C drive. Update: You can download the script file from here. Once your PC is compatible, you’ll see success message at the end and a schedule task will start to open the app (check the screenshot below). UPDATE: Those who found the script running for a long time or stuck in a loop, download and run this file. UPDATE: Updated the script above. According to Microsoft, “The Microsoft Compatibility Appraiser can take 10 – 30 minutes to run, during which the script will continuously provide status reports that it is running. Please be patient. If the above method doesn’t work for you, try the below one. GWXTriggers , select ‘refreshgwxconfig-B’ and run it. Here we’re sharing a batch file provided by Microsoft community moderator. Download the batch file from the below link and follow the on-screen instructions. Try this alternate link for Win10fix_full.zip if you’ve issues in the downloading the file from above (removed because dropbox file download page is not opening). After extracting the file, you need to right click on it and select’Run as administrator’. Note: This batch file makes changes to files and registry settings, we’ve not tested it. Try it at your own risk. If your device is a member of domain, remove it from domain and add it to local ‘workgroup’. Uninstalling and reinstalling KB3035583 update has showed the icon in the tray for some users. Second option in Method 3 for batch file is working for some users. Have you reserved your Windows 7/8.1 PC for the Windows 10 upgrade? If you’ve successfully reserved your PC for Windows 10 upgrade, know this: Microsoft has pushed Windows 10 downloading to reserved systems. Check below links or this site Home page for latest information on what’s happening. Using the Media Creation Tool released by Microsoft for windows 10 (check the below link), you can able to quickly upgrade to Windows 10 from Windows 7 or 8.1 — trust me this is downloading the OS quicker than the Windows Update– (internet connection is required) or download the ISO file. If your Windows 10 downloading taking lot of time (check $Windows.~BT Folder. in reserved system drive, it should be around 6 GB), then use tool to upgrade to Windows 10. STUCK SOMEWHERE?? DO LET US KNOW IN THE COMMENT!!! Harry Cobra liked this on Facebook.